No one anticipates or expects a premature death. Nevertheless, most responsible parents have life insurance policies to protect their families if the unthinkable does occur. Similarly, no couple anticipates or expects a divorce. Nevertheless, responsible spouses obtain insurance policies, in the event that the unthinkable does occur. The legal term for this insurance policy is a prenuptial agreement. Incidentally, this approach is often a good way to discuss the “p-word” with a future spouse, because broaching the subject can be delicate, to say the least. Illinois follows the Uniform Premarital Agreement Act, which helps ensure consistency among the states in terms of the content and enforceability of premarital agreements. The law also applies to postnuptial agreements between spouses. In a nutshell, a premarital agreement can cover any financial terms except child support. Neither the amount nor duration of payments can be altered, although the manner of payment may be at least somewhat negotiable. A prenuptial agreement may cover financial matters like real property division, spousal support, personal property distribution, and other ownership questions. To be enforceable, each provision must have consideration, which is either something of value received or something of value given up. There must also be mutuality, which means that both parties agreed to the same terms at the same time. 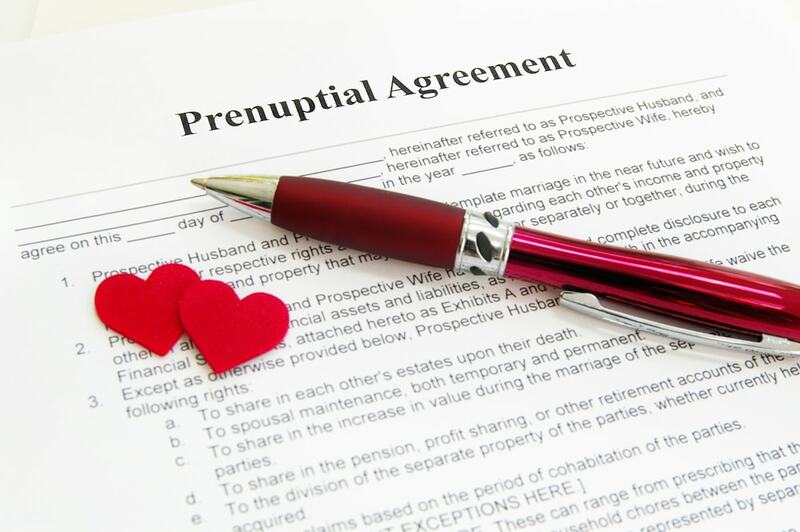 A prenuptial agreement can also cover inheritance and other non-financial issues. These concerns are often a factor when one or both spouses have children from a previous relationship. However, a premarital agreement cannot cover Parental Responsibility Allocation matters. These decisions must be based on the best interest of the children at the time of divorce. Judges give a great deal of deference to write agreements between spouses, but this deference is not unlimited. There are two primary ways to overturn a premarital agreement in a subsequent proceeding. Lack of voluntariness is not a very effective tool, at least in most cases. Courts practically require an element of physical force to establish that the signature was coerced; a “sign-or-else” ultimatum is normally not sufficient. The best way to establish a lack of voluntariness is to show that the signing spouse was unrepresented or underrepresented, at the time the agreement was signed. The second defense is that the agreement was unconscionable when made. Both elements of this defense deserve closer attention. Note that the statute does not use a term like “inequitable.” A 60-40 split is uneven, but such a division is by no means unconscionable. Moreover, the agreement must be unconscionable at the time it was signed. Some people may be familiar with the Frank and Jamie McCourt divorce, the former owners of the Los Angeles Dodgers. In a written spousal agreement, Ms. McCourt gave up most of her interest in the franchise in return for certain financial considerations. Several years later, after the team’s value had increased dramatically, Ms. McCourt tried to have the agreement thrown out, on the grounds that the terms were manifestly unfair. But a court ruled that the agreement was not unconscionable when it was made, and allowed it to stand. To get your marriage off to a better start with a premarital agreement, consult with an experienced family law attorney. Call Reidy Law Office LLC today.